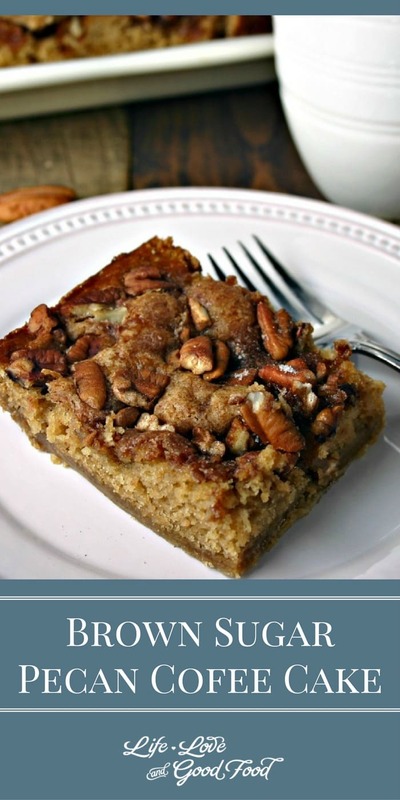 Brown Sugar Pecan Coffee Cake is a deliciously moist coffee cake on a brown sugar crumb crust with a pecan topping baked right on top. 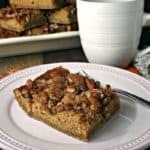 Brown Sugar Pecan Coffee Cake is a deliciously moist coffee cake on a brown sugar crumb crust with a pecan topping baked right on top. This classic recipe comes straight from one of my trusty Southern Living cookbooks and certainly did not disappoint. 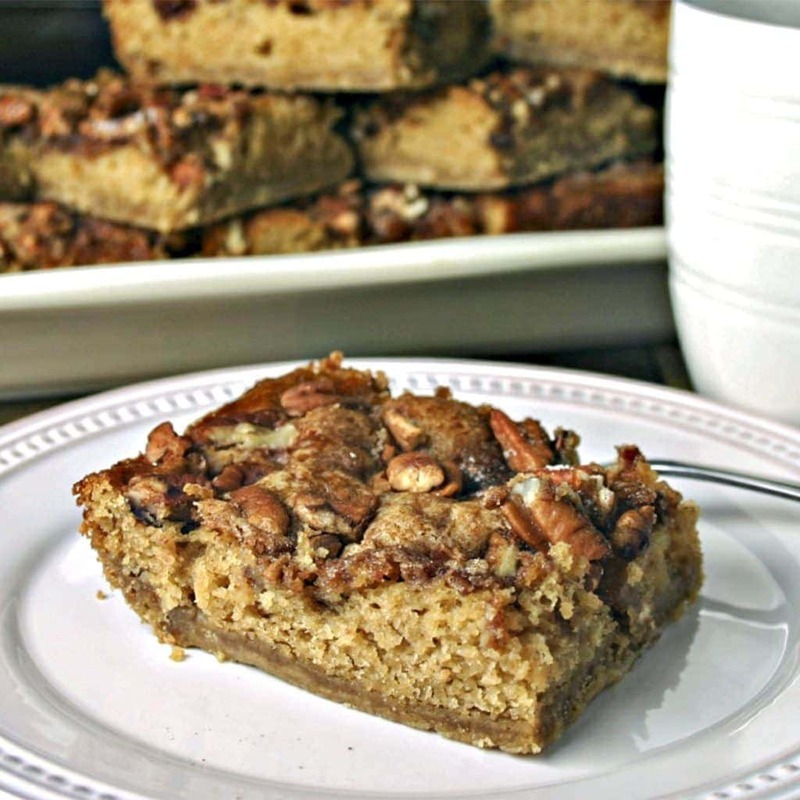 One thing I like about this recipe is that other than the pecans there are no special ingredients required — everything is a staple item found in most everyone’s pantry. This brunch dessert can be made ahead of time and stays moist for several days if covered tightly…but you won’t have to worry much about that! I left this coffee cake in the kitchen at work and within the hour all that was left was crumbs! The crumb crust allows for easy hand-held, on-the-go eating as well. Who needs a fork?! Putting this recipe together starts by combining flour and brown sugar and then cutting in cold, cubed butter with a pastry blender until the mixture resembles coarse crumbs. Half of this mixture is patted into a lightly greased baking dish to make the crumb crust, while the other half is combined with the remaining batter ingredients and poured on top. Since you’ll be using more than a whole stick of butter for this recipe, use the butter wrapper to quickly and easily grease the pan…this is one of my favorite kitchen hacks! All that’s left to do is to sprinkle a sugar-cinnamon-pecan mixture all over the top and then pop the whole thing into the oven to bake. 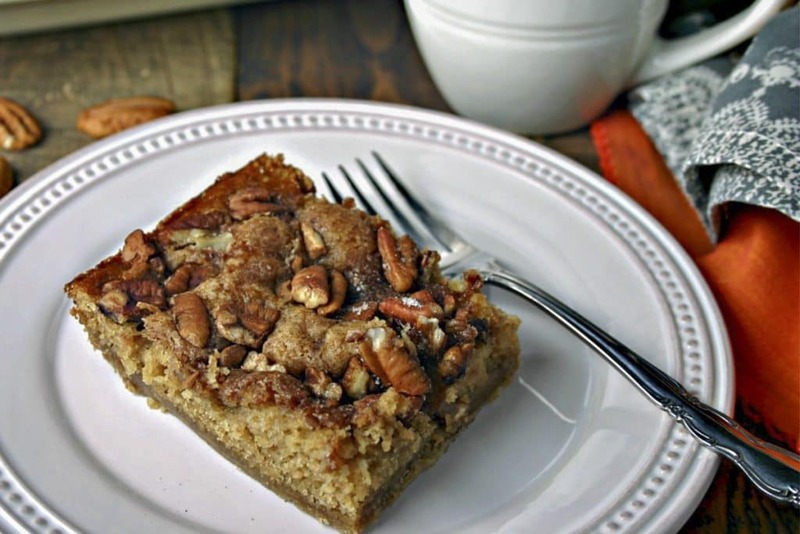 I can’t really decide if this recipe should really be called a coffee cake or some type of brown sugar bars, but either way it works as a perfect breakfast cake or afternoon coffee break dessert. If you serve this one at your next weekend brunch, don’t be surprised if you’re asked to make this recipe again! If you prefer “fruity” coffee cakes, then you might like to check out this Raspberry Ricotta Cake or Cherry Cake with Buttermilk Powdered Sugar Glaze instead. Enjoy, friends! Preheat oven to 350 degrees. Lightly grease the bottom of a 13x9 inch pan; set aside. 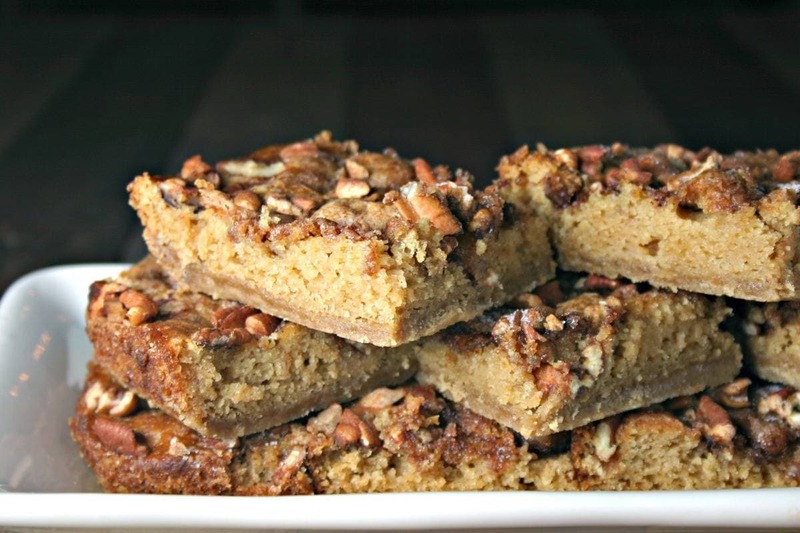 Prepare crumb mixture by stirring together the flour and brown sugar in a large bowl. Add the cubed butter and cut in with a pastry blender until crumbly. Press 2 3/4 cups crumb mixture evenly on the bottom of the prepared pan. In a small bowl, combine the sour cream, egg, and baking soda, then add to remaining crumb mixture, stirring just until dry ingredients are moistened. Pour onto top of the crumb crust. Stir together 3 tablespoons of sugar, the cinnamon, and pecans. Sprinkle this evenly on top of batter. Bake for 25 to 30 minutes or until a wooden pick inserted into center comes out clean.